their pictures, "Jews' Wailing Place." In the need for library and archival preservation, modern technology is certainly a friend of antiquity. Vintage photographs, some stored for over a century in old libraries, are now being digitized and often posted Online. 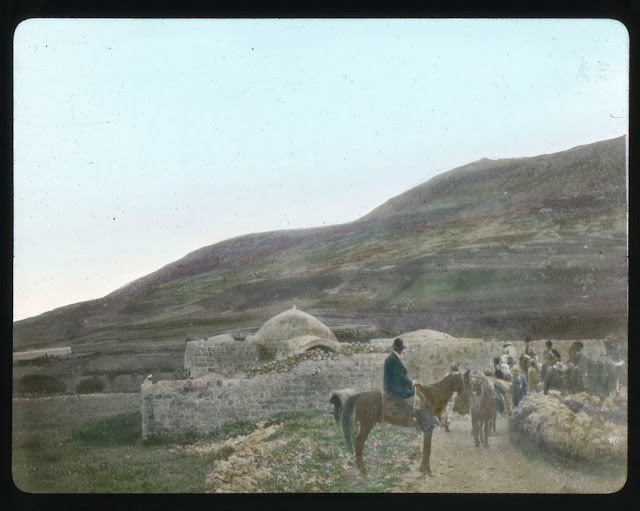 Such is the case with this treasure of "Holy Land Lantern Slides" we found in Chatham University's archives. Chatham University, a 150-year-old women's undergraduate school in Pittsburgh, digitized their slides in 2009. According to Rachel M. Grove Rohrbaugh, the school's archivist and public service librarian, "most of the slides roughly date to circa 1880-1900. We don’t have specific information on the photographer(s) or how they were used here at Chatham, but they were likely used for instruction in world history or cultural studies." 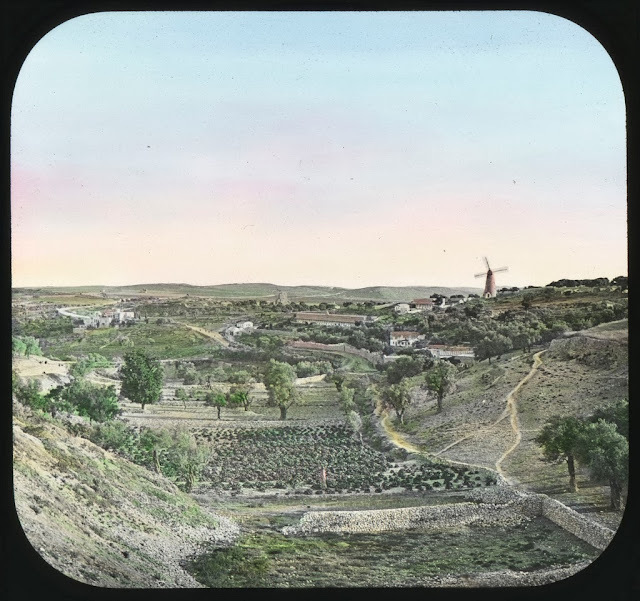 near the Jaffa Gate, shows the Montefiore windmill, built in 1858, and the Mishkenot Sha'anaim homes beneath it. mill stopped turning in 1876. We thank Chatham University Library for permission to publish these well-preserved hand-painted lantern slides. In the 1880s, before movies or electricity, pictures such as these were projected in front of classes or audiences using a kerosene-lit lamp fitted with special lenses. The slides were produced by optical manufacturers who sold the lanterns. The makers of the Chatham slides were identified by Chatham's archivist as T.H McAllister Co. and Williams, Brown, and Earle, of New York and Philadelphia respectively. 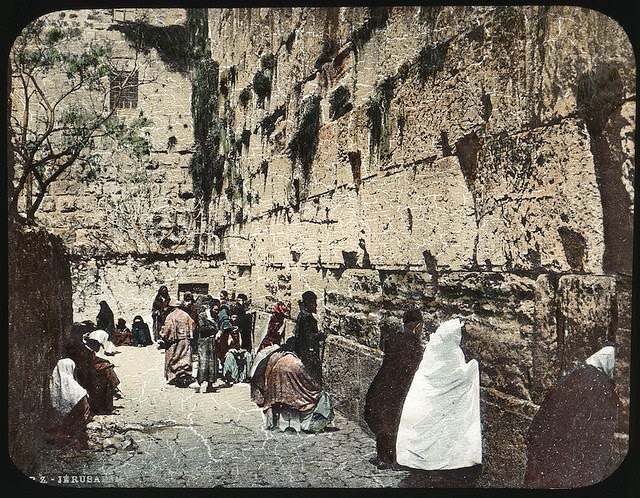 An enlargement of the picture shows a sign, "Mission to the Jews," inside the Jaffa Gate of the Old City of Jerusalem. German, Anglican, and Scottish Protestant church missionaries were very active in the Holy Land in the late 19th century. At the time, this intersection of the Old City was probably one of the busiest ones in Jerusalem. Your site is a great resource! 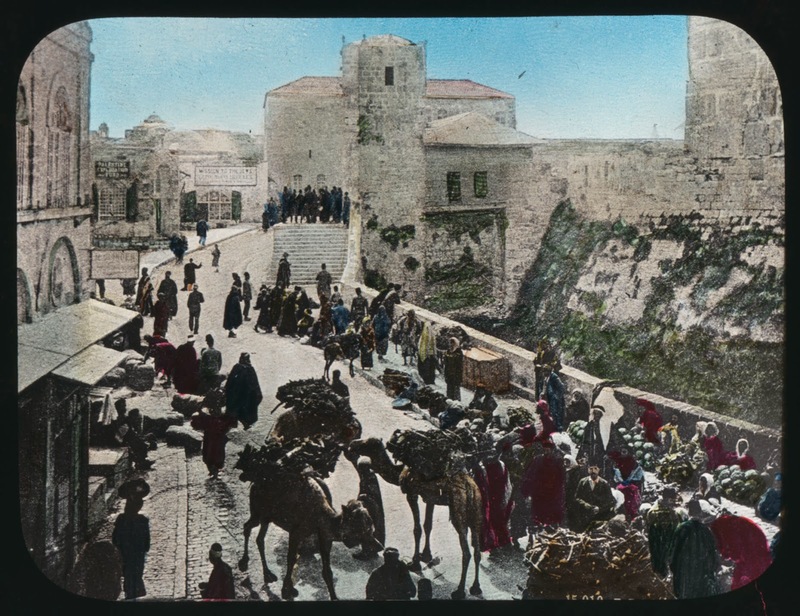 I think that the photo of "Inside the Jaffa Gate" is actually looking south. The visible steps lead up to the entrance to the "citadel"—still there, and the sign (next image) is above the entrance to what is now the Christ Church coffee shop. The moat on the right side of the image is still not filled in today - so I don't think that the dating as "prior to the 1898 arrival of the German emperor" is not convincing—at least based upon the moat being filled in or not. mill stopped turning in 1876. " In my opinion the blades are not moving. The "blade" consist of a mast and a lattice framework of orthogonal lighter spars. A sail is usually spread over this structure. The sail is missing and what we see is the "lattice". Since the spars are a bit below the resolution of the picture, they appear as a blur, whereas the mast is not blurred by motion but rather by being just a bit above the resolution. My guess is that the picture is after the mill stopped turning, and the sails removed (by deterioration?). Or perhaps the mill was still active but the sails were removed for lack of flour or very high winds.